30 minutes. Headphones optional. Eyes open or closed. Loopable. Includes full usage guide. Switch on your naturally creative side to get a brain that’s buzzing with ideas, overflowing with imagination, and bursting with inspiration. Set your creativity free and let it take you to fresh and original places you’ve only ever dreamed of. 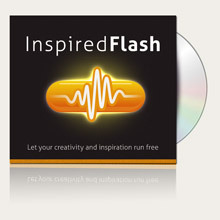 With the main beat tracking between theta (5Hz) and beta (14Hz) to fish out novel thoughts and lock them in your awareness, plus a rapidly changing gamma (30-50Hz) to keep the cortex firing, InspiredFlash is perfect for any form of technical or artistic expression.